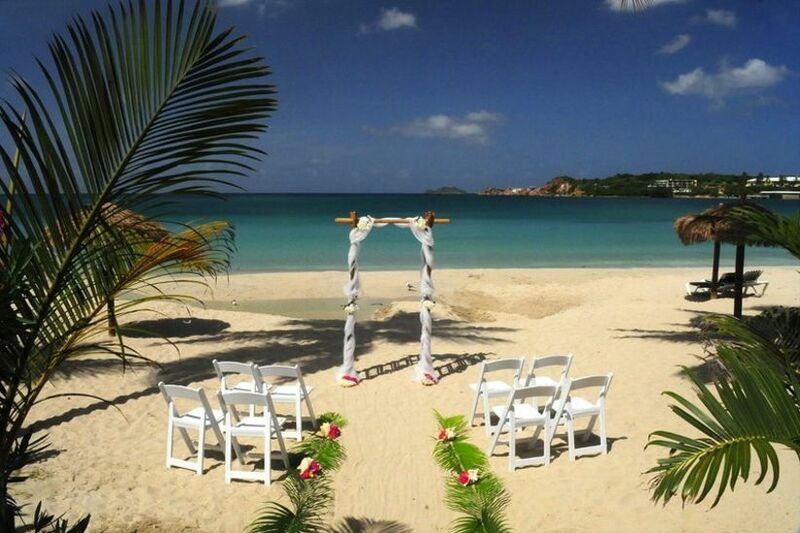 6 U.S. Virgin Islands Destination Wedding Venues—No Passport, No Problem! A faraway beach destination that you don't need a passport to visit? Yes, please! 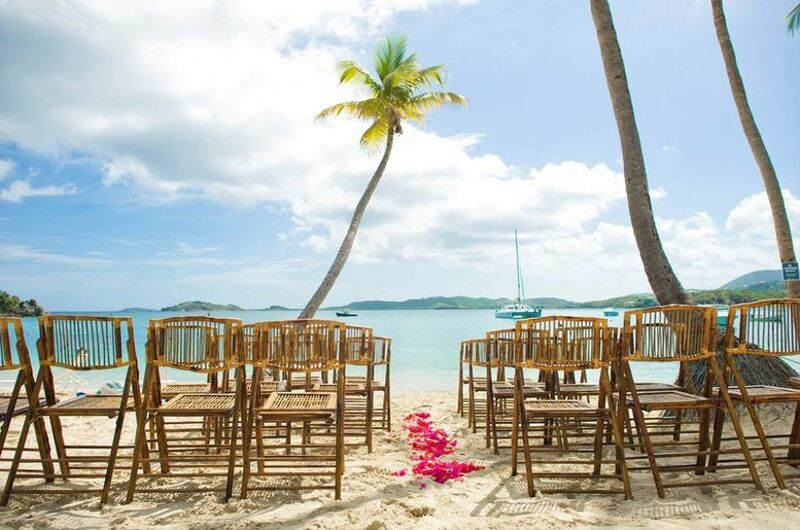 The U.S. Virgin Islands is an ideal spot for a destination wedding—here's how to plan yours. Pop quiz: where can you travel to, sans-passport and feel like you’ve arrived in a tropical wonderland that doesn’t seem anything like your home country? Hint: start marching in the saints—and you’re getting close. For couples who want to break free of the mainland of America but still enjoy the perks of their citizenship, a Virgin Islands destination wedding fits the bill. Nestled beautifully in the Caribbean island, this stretch of United States territory is renowned for having some of the most remarkable, white-sand beaches in the world, as well as diverse wildlife and flora, and mouthwatering, spicy cuisine. Here, everything you need to know about planning a Virgin Islands destination wedding. Not too hot, not too rainy. Not too busy, not too vacant. Ask any engaged couple and they’ll rattle through their picture-perfect vision for their big day. Though marriage (and ahem, nuptial planning) is all about compromise, you can have the ideal weather forecast if you pick the right date for your Virgin Islands destination wedding. The best time to ‘save the date’ is between April and June, where showers are minimal and the sunshine ample. The peak season for the USVI is when its winter nearly every else in the States—from December to March. During this time, you might expect weather to hover from the mid-70s to the high-80s. As with any country in the Caribbean, it’s better to steer clear of the USVI during hurricane season, from mid-September to November until the threat dies down. Unlike most overseas ceremonies, if you’re an American citizen, you don’t need any special paperwork to host your Virgin Islands destination wedding in any of the three territories. In fact, the whole process is conducted online, with no blood test or waiting period required. You will need to go through the paperwork and expect to provide a copy of your passport, birth certificate, and if applicable, proof of divorce or death. From there, it’s pretty straightforward and you can get to planning your grand affair. 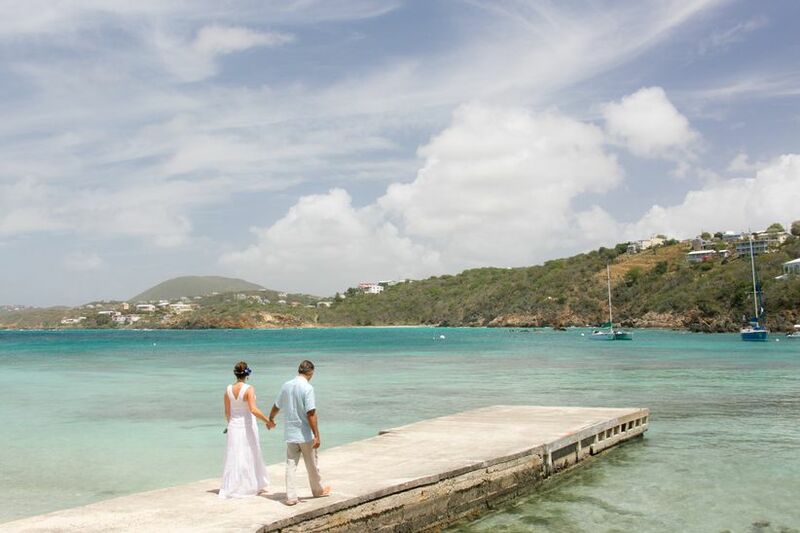 As the name suggests, the Secret Harbour Beach Resort in St. Thomas offers more privacy for laid-back couples planning a Virgin Islands destination wedding. Whether you and your number one are eloping without anyone knowing or you want to keep your vow exchange intimate from anyone else, this venue provides couples the option to cater every last detail to their perfection. Consider making it official in a grand ballroom, or by the water, as the sun makes its nightly descent into the sky. Especially if you’re seeking comfort and luxury, you’ll also appreciate the condo-style apartments and condominiums that might entice your entire party to extend their vacation. St. John is known for its luxury appeal, with endless villas and five-star properties, all providing the gold standard of service for travelers, families and most of all, engaged couples. This Westin location overlooks the ever-romantic Great Cruz Bay, featuring a nightly, colorful sunset, shading the sky as rose-colored as your eyes. 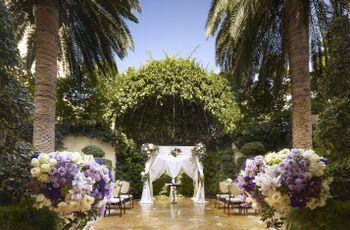 The on-site wedding team will help you figure out which location on their impressive property is best for your style—from the garden gazebo to the palm terrace and beyond. If you want a gorgeous backdrop for your Virgin Islands destination wedding, the hilltop garden area will take you, your partner’s and all of your guests’ breath away. Forget the day-time waltz down the aisle or calling the night early at 9 p.m.—you’re the type of couple who wants to marry as the sky changes colors above your heads and dance your way into the night. Because of its location, this Virgin Island destination wedding venue is one of the only to offer a sunset view, making it irresistible for vitamin D-chasing pairs. The boutique Emerald Beach Resort only features beachfront rooms, all of which feature ocean views, so no guest is left without. 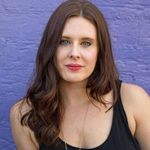 One of their most recommended features though, is the onsite team who walk you through every question, request and hope, allowing you to live in every second of your wedding vacation, instead of crossing off a checklist. As one of the most sought after honeymoon islands in the Northern Hemisphere, St. John defines allure and romance unlike any other option for a Virgin Island destination wedding. The only issue, of course, is expense. If you’re struggling to maintain a budget but still fantasize about a tropical wedding, the Gallows Point Resort will help you have your wedding cake—and eat it, too. It was ranked as one of the most affordable honeymoon destinations in the world, and their wedding package services mimic the competitive price point. When you host your once-in-a-lifetime event here, you get your pick of three landscapes: from beachy water views and plush gardens to an indoor party. Let their coordinators iron out the schedule—while you and your spouse-to-be start popping the champagne. 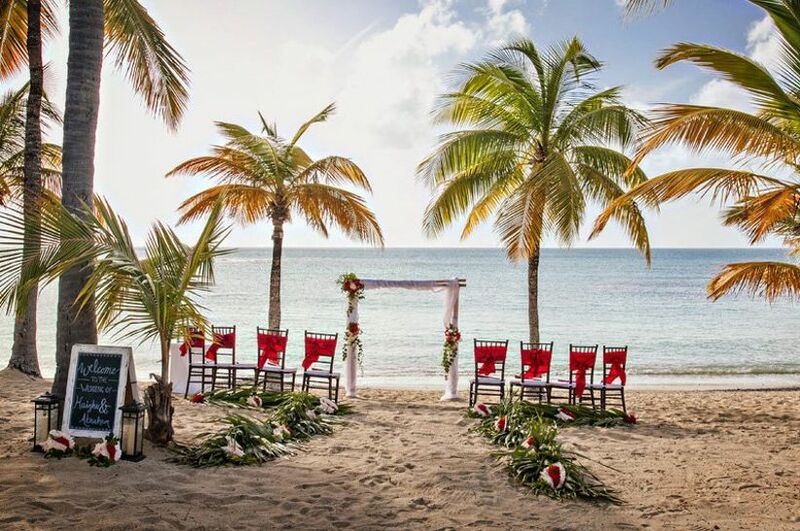 As the Caribbean’s longest-running resort built in the 17th century and family run for generations, you’ll feel as if you’re making history while being party of history when you wed. In the soul of St. Croix in Christiansted, your Virgin Islands destination wedding can be hosted at a centuries-old Sugar Mill that overlooks the Caribbean, or at their many other venues, including the quaint Cotton House for a small affair, or the Mermaid for up to 125 guests. 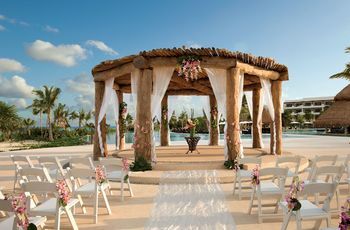 Though The Buccaneer offers four wedding packages, they can carve out special exceptions for a special duo, too. In the beauty and glamour of St. Thomas, this Virgin Islands destination wedding adds a bit more sparkle to your getaway celebration. 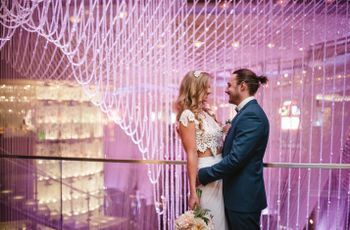 Regardless if you’re whisking away to have a ceremony just for two or an overflowing party of 100 or more, their two onsite venue options can cater to your size. 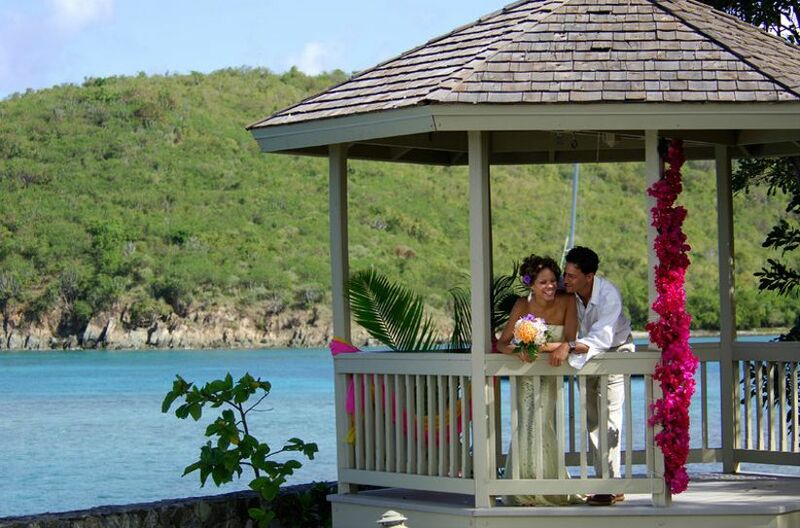 The St. John Terrace offers a flower-adorned gazebo overlooking the Caribbean blues, while their private beach allows you to walk barefoot down a seashell-outlined aisle toward the love of your life. 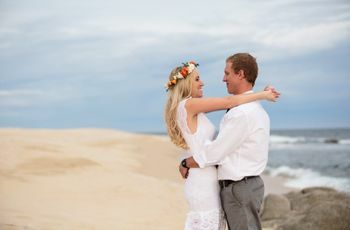 Professional wedding coordinators at the Wyndham Sugar Bay can answer all your questions—and help you build a memory (and a marriage) that’ll last your lifetime.